Hachiman Hikigaya is a high school boy with twisted character. He prefers to go against the trend and refuses to make friends with anybody. In order to get Hachiman back on the right track, his school teacher Shizuka Hiratsuka forces him to join the "Public Service Club." There he meets other problematic students. 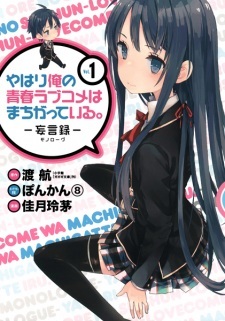 Alternative version: Yahari Ore no Seishun Love Comedy wa Machigatteiru. What the oregairu anime lacks is the depth of character, and a good ending. What the manga offers is stronger character development, backstory, and each character has some kind of importance or impact on the overall plot of the manga. Various scenes, while seeming unimportant, further develop the characters involved and gives the viewer a deeper understanding of the emotions and thoughts of the characters. In oregairu anime, the minimal amount of episodes causes details that are essential to the plot and characters to be removed in favor of an animated series. The events of the manga keep the viewer asking for more as the plot continues. The characters have realistic weaknesses and strengths, but each of them are enjoyable to watch and have unique and interesting quirks about them. In total, I give this manga an 8/10 for its attention to detail and fantastic and thrilling story.